IT WAS not until Dan Purdie saw his name written on an honour board in Queensland Parliament that his election really sank in. The LNP MP for the new seat of Ninderry has had a number of "pinch myself moments" in his first week of parliament - but none more so than standing next to his wife and his mother and seeing his name listed as a member. 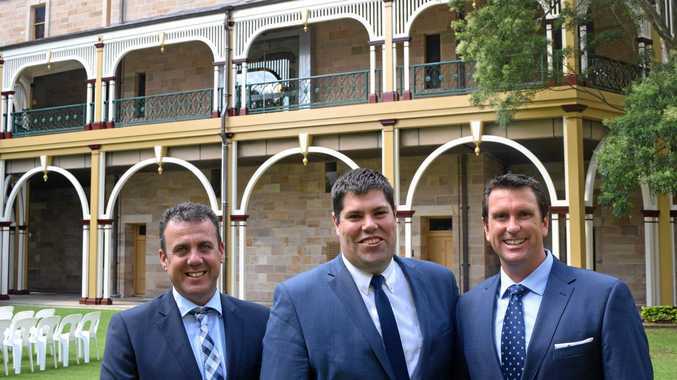 Mr Purdie is one of three new LNP MPs on the coast, alongside Nicklin's Marty Hunt and Buderim's Brent Mickelberg. The three have vowed to keep the coast on Labor's agenda despite the region not having a voice in government. Mr Hunt said despite a difference of politics with his predecessor, long-time independent Peter Wellington, he hoped to replicate his close contact with the Nicklin community. Mr Hunt said he would ensure the Sunshine Coast was heard in parliament. "That is what the coast voted for," Mr Hunt said. "We took policies like duplicating the rail line to the election and the Sunshine Coast overwhelmingly backed us. So that's our job. To keep the coast on the government's agenda." Mr Hunt, a former police officer, swore his parliamentary oath on the same Bible he swore on when he joined the police force three decades ago. Mr Mickelberg said he would fight to improve transport access on the coast and reduce congestion on the Bruce Highway. "We went to the election with a policy to duplicate the Sunshine Coast rail line and I can guarantee that I'm not going to be letting the issue go anywhere," he said. In a high-profile campaign, Mr Mickelberg defeated One Nation defector Steve Dickson; Mr Hunt replaced former independent Peter Wellington; and Mr Purdie was elected in the new seat of Ninderry. Labor election promises to the coast included: planning and building southern Bruce Hwy upgrades; a $15 million contribution to the Sunshine Coast international submarine broadband cable; plans for a new Caloundra high school; and hiring more police officers, nurses and midwives on the coast. Mr Purdie said along with big-ticket items he was determined to push for needed local upgrades. "Just as important are the very local needs for my electorate. I'm under no illusion that billion-dollar cheques grow on trees," he said. Mr Purdie said before Thursday's sittings he wrote out a question about a Coolum roundabout to ask Transport Minister Mark Bailey during Question Time - even though he knew he would not get to ask it. An MP's maiden speech is considered a landmark for them and given special consideration. A new MP asking a question in Question Time would be considered their maiden speech. The three are expected to make their maiden speeches during the next sitting week in March. Mr Mickelberg said he wanted to address youth crime, although he admitted it was not his constituents' top priority.